Warning! If out of stock, all the Niwaki Pro range suffer from long lead times with uncertain delivery dates. Hard wearing, heavy duty secateurs for all-round use in the garden. 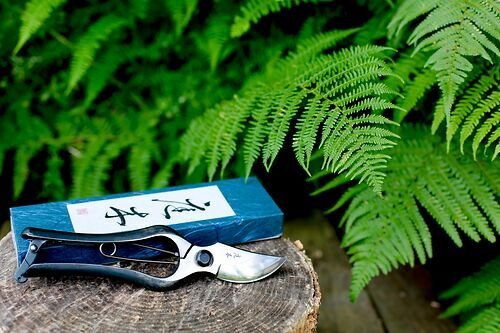 Hand forged in Hyogo, from S58C carbon steel, with a solid, chunky catch at the bottom and a robust spring, these secateurs combine great Japanese craftsmanship with tough, edge-retaining steel and a comfy grip for prolonged use. How do they compare with Tobisho Secateurs? Same forging techniques and quality, but with a slightly heavier, tougher feel to them - at this level, it's down to small details and individual feeling. Niwaki Tip: Keep them sharp with a Niwaki #1000 stone, but also keep them clean - it's so easy, and makes such a difference.